Novak Djokovic's third-round struggle with defending champion Grigor Dimitrov was halted by rain, forcing the pair to come back on Friday at the ATP-WTA Cincinnati Masters. Officials called a halt to a frustrating day on which Roger Federer was never able to take the court for his third-round match against Leonardo Mayer. Wimbledon champion Djokovic is vying to break through for a first Cincinnati win after coming up empty in five finals. He lost the first set 6-2 and won the second 6-3 when rain stopped the contest for 90 minutes. When play resumed, Djokovic edged ahead 2-1 in the third, but another storm rolled in and organizers called a halt. Cincinnati remains the only one of the nine Masters 1000 events that the Serb star hasn't won. He has lifted trophies at least twice at each of the other eight events in the elite ATP series. 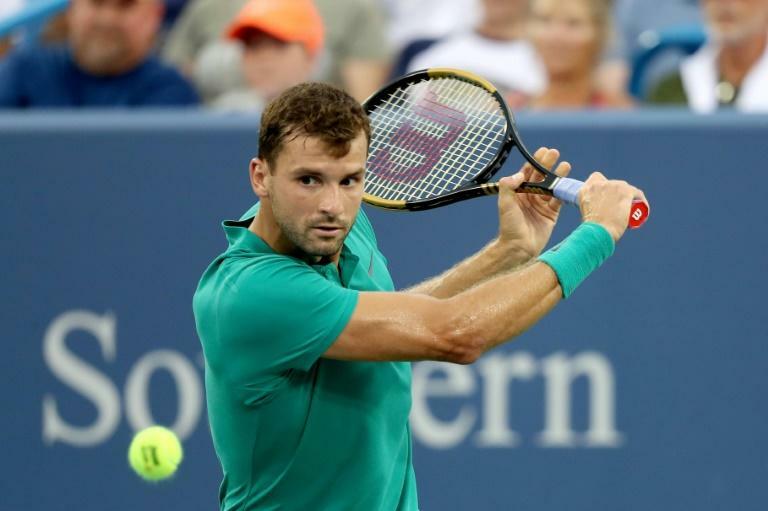 Bulgaria's Dimitrov, who has won just one of eight prior encounters with Djokovic, prevailed easily in the opening set and broke early in the second before Djokovic roared back, breaking for a second time to take a 5-3 lead. The 10th-seeded Serb squared the match as the day's second bout of major rain moved in. Earlier, Simona Halep and Juan Martin del Potro at last managed to complete weather-delayed second-round victories. World number one Halep took advantage of an early afternoon respite from the weather to finish off a 4-6, 6-3, 6-3 victory over Ajla Tomljanovic. Halep, clearly frustrated when the match was halted at 3-3 in the third on Wednesday night, won three straight games to finish off the victory in 10 minutes -- just in time for drizzle to set in. Argentina's world number three del Potro had played just six points in the first game of his postponed second-round match against Chung Hyeon before the rain came again. But the weather cleared long enough for del Potro to polish off a 6-2, 6-3 win over the South Korean to set up a meeting with Australian Nick Kyrgios for a place in the quarter-finals - a match originally set for Thursday night but now on tap for Friday. Two men's quarter-finalists were decided as Milos Raonic defeated Denis Shapovalov 7-6 (8/6), 6-4 -- avenging a loss to his young Canadian compatriot in Madrid three months ago. Pablo Carreno Busta also advanced, beating Robin Haase of the Netherlands 6-4, 6-2. In women's third-round action, reigning US Open champion Sloane Stephens was eliminated while Madison Keys, runner-up at Flushing Meadows last year, moved on. Belgian Elise Mertens scored the second top five win of her career, beating Stephens 7-6 (10/8), 6-2 while Keys rallied to defeat fourth-seeded Wimbledon champion Angelique Kerber 2-6, 7-6 (7/3), 6-4. Keys fired 55 winners with 44 unforced errors against the German, who is playing her first hardcourt tournament in the buildup to the US Open. "I had to keep it cool, she gets lot of balls back," Keys said. "I used my forehand and serve well today. I'm really happy and I'm looking to go further." Keys next faces Aryna Sabalenka of Belarus, who upset French sixth seed Caroline Garcia 6-4, 3-6, 7-5. Petra Kvitova, who toppled Serena Williams in the second round, reached the last eight with a 6-4, 6-2 win over France's Kristina Mladenovic. "I just need to get out there and really fight, I was telling myself to fight," the two-time Wimbledon champion said. "I did a lot of talking to myself today, pushing myself to just go for it. I'm glad that in the important points I played aggressively - that was important today."